Product prices and availability are accurate as of 2019-04-05 05:50:34 EDT and are subject to change. Any price and availability information displayed on http://www.amazon.com/ at the time of purchase will apply to the purchase of this product. 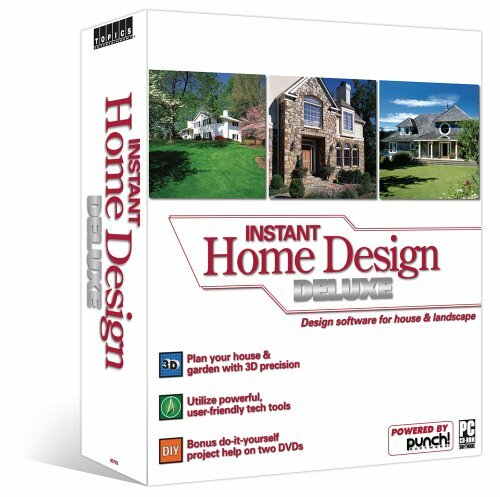 Save time and money on that landscaping project or home renovation, with the user-friendly tech tools of Instant Home Design Deluxe. Use the finishing tools to apply custom-mixed colors and surface materials including stucco and brick, and to drop designer touches---everything from a pond to painted edgings---into your drawing. When you’re ready to view your completed handiwork, the touring tools let you set the pace of your three-dimensional walk-through. Whether changing your yard’s topography or building three stories from the ground up, let Instant Home Design Deluxe take you from desktop to dream home.